DT Inky Impressions Inspirations - Card Have fun! Hoje o meu Post é do DT Inky Impressions Inspirations! Minha Inspiração hoje é um Cartão simples com um carimbo muito divertido e descolado! Estou falando do Carimbo Digital Jammin'On Ipod que você encontra aqui. Eu acredito que quando você escuta a música e ela toca a sua alma é mágico! Hi Girls!This is my Post for Inky Impressions Inspirations today. 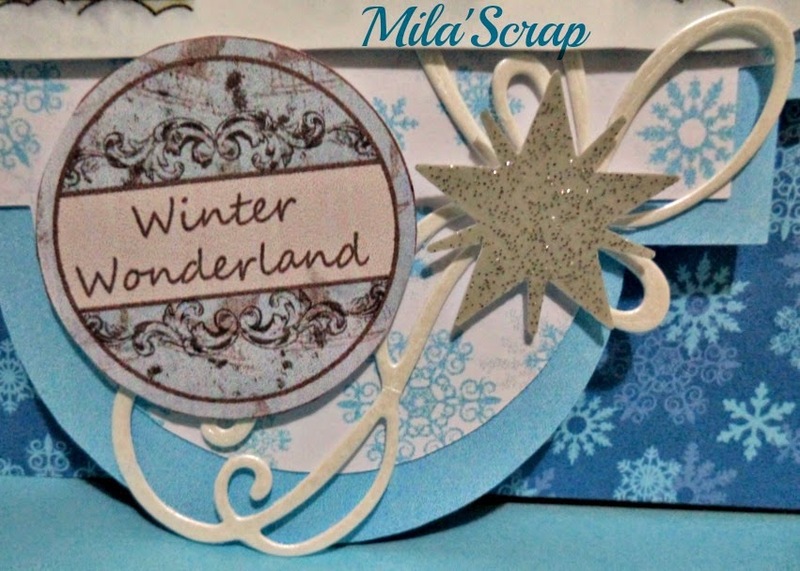 My Inspiration Today is a simple Card with a very fun stamp! This is a Digital Stamp Jammin' On Ipod that's you find here. She's so cool and fun and remember me my son that's a teenager and listen music all the time! And I do the same in him age! I believe that when we feel the music in the soul it's magic! Here go to the Card! I hope you like!See you in next Post! Espero que todos tenham tido Ótimas Festas e Desejo um 2015 Maravilhoso para todos! Nosso desafio da semana é Anything Goes. Ótimo para essa época de Férias e para soltar a imaginação! 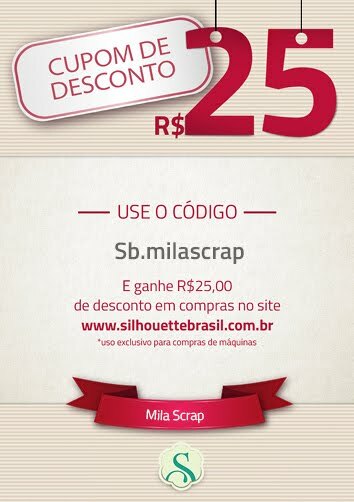 Como não tivemos o Desafio na semana anterior resolvemos fazer 2 cartões! Obaaaa! I hope you all had Great Holidays and wish a 2015 Wonderful for everyone! Our challenge this week is Anything Goes. Great for this time of holidays and free your imagination! As we didn't have the Challenge in the previous week we decided to make 2 cards! Yayyy! 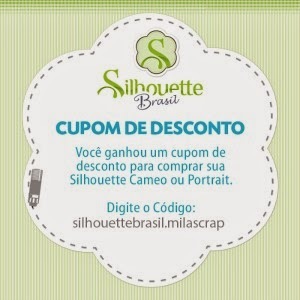 Nesse útimo cartão usei o papel Dourado da OKscrapbook de background e de fundo também para bater a foto. Espero que vocês tenham gostado e até a próxima postagem! 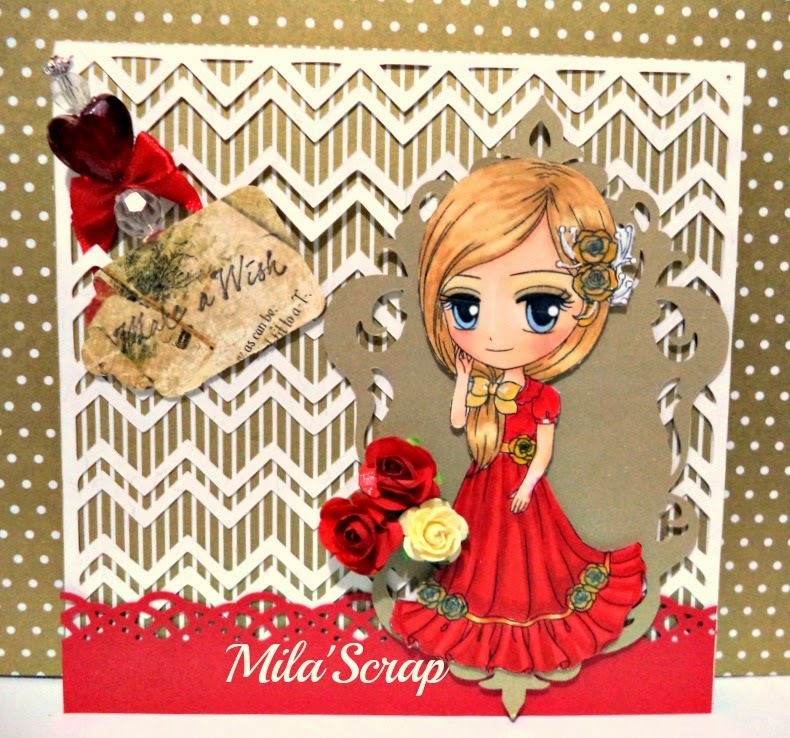 In this last card I used OKscrabook Papers on the background of the Card and like a background to take a picture. I hope you like and see you in next post! 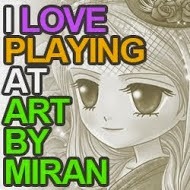 This my post for my DT Call for one of my favorites brand: Art by MiRan! 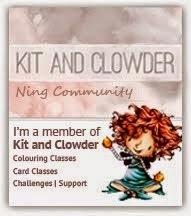 I met the stamps of Miran Jung at the Alyce Kit and Clowder group because I had been class there are 5 or 6 months. When I fell in love at the time, and wanted to join the group and to know what the store to start coloring those delicate and stunning stamps! I was very exciting. First entered the blog and there was a post talking about the DT Call (was before this) and just wanted to participate, but the inscriptions had just one day before ... I was devastated, still wanted to know if I could have my own work and unfortunately couldn't but MiRan told me will have one at the end of the year, there I'll can participate! I was upset, but I started to buy and color your stamps and to dedicate myself even more coloring and continue with my course and started the second too! As I was coloring in the first semester and was attended DT Chi Chi Memories and when now I'm a DT Inky Impressions and DT Totally Gorjuss and love being DT and I am improving every day! So the months went faster than I thought and when I saw the post to the DT Call was very happy and excited about the real possibility of join this team and represent you through my art! I really want to go because I know I can help with everything I learned up here (in Scrap are already four years and coloring are 2!) And I know I will learn even more and with my projects and videos I can be a great DT! It will be a dream come true! 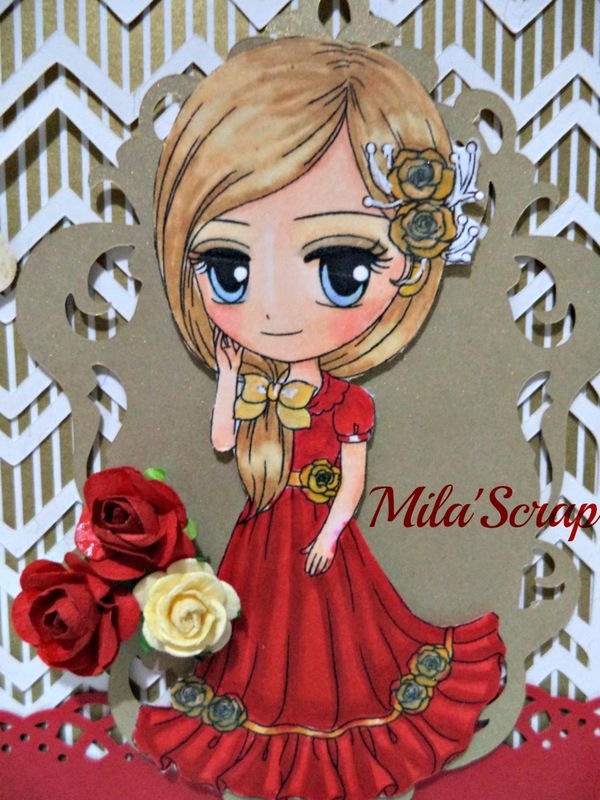 And that, I tried that card and colorful stamp Rosalie (I love) spend all my love and Rosalie enhance the beauty even more as you can see in the pictures! And always try to do a different card the other with another proposal, or even another type of Project is not only the card! I also think that a difference in my work. 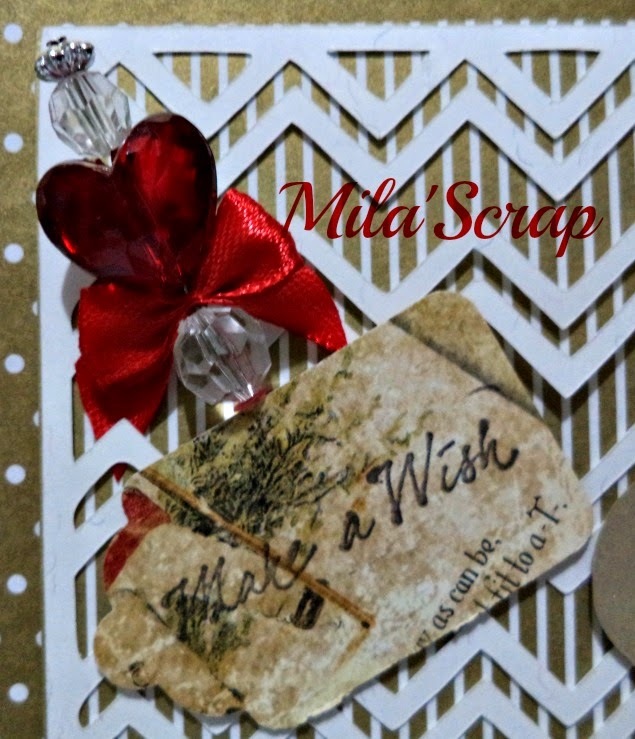 This is my card Make a Wish with Rosalie stamp and I love it! 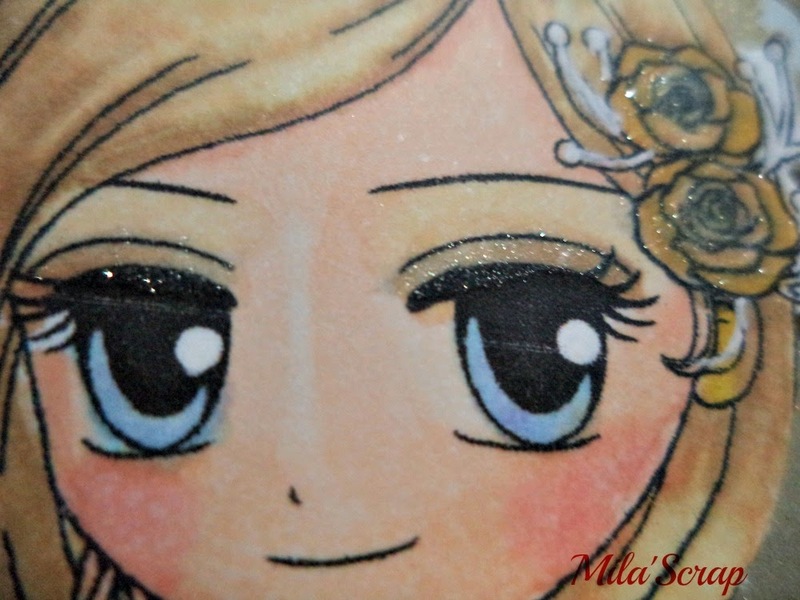 Here the close is to show better the sparkles in the flowers in her hair. Her more closer to show her Face because when the stamp have space I make up my girls! Oh I love to do this so much! They can see the brightness of the shadow in his eyes! And here a close of the sentiment: Make a Wish! And a lovely embelishment! Hopefully fingers crossed be chosen to join this team which so love the stamps! I hope you enjoy and see you next Post! I don't know when I start...I will never imagine that my teacher (double teacher!) will be a friend so close and I have a proud to be part of your sucess in all this year. You are unique Aly! Love you girl! Hoje eu venho postar minha inspiração para vocês com Inky Impressions! A escolha de hoje foi uma cartão simples, o Easel Card, mas valorizando o nosso trabalho. Dando destaque a pintura e o que usamos para embelezar nossos cartão nossas Facas que transformam qualquer trabalho enriquecendo mais ainda o nosso trabalho! Today I come post my inspiration to you with Inky Impressions! Today's choice was a simple card, Easel Card, but valuing our work. 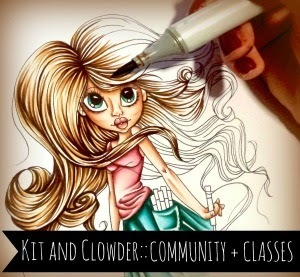 Highlighting the coloring and what we use to beautify our design our dies! That's transform any work enriching further our work! Espero que tenham gostado e se sentido muito Inspirados! Hope you like and will very Inpiration! Oie tudo bem com vocês? Comigo esta tudo ótimo! É sempre bom o tempo de Renovação, Novidades e elas estão vindo uma atrás da outra! Maravilha ne? É a melhor forma de ter seu trabalho reconhecido e isso é muito gratificante! Estamos sempre buscando novidades para vocês também! É com muito prazer que venho não só contar, mas mostrar para vocês que agora sou uma Inkette! Isso mesmo agora faço parte desse grande Design Time e toda semana vou postar para vocês algo para inspirar! Desde de o dia 18/11 está acontecendo o Lançamento dos Carimbos Digitais de Novembro! E agora vamos ao cartão! With me it's all great! It's always good weather Renewal, News and they're coming one after another! Wonder!! It's best to have your work recognized and it is very rewarding! We're always looking for news for you too! It is with great pleasure that I come not only tell, but show you that I am now a Inkette! That even now I am part of this great Design Team and every week I will post something for you to inspire! 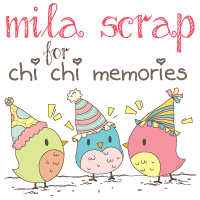 Since the day is going 18/11 It's happen a Release of Digital Stamps of November! And now for the card! Aqui o Cartão com Angelica's Sled que você encontra aqui! 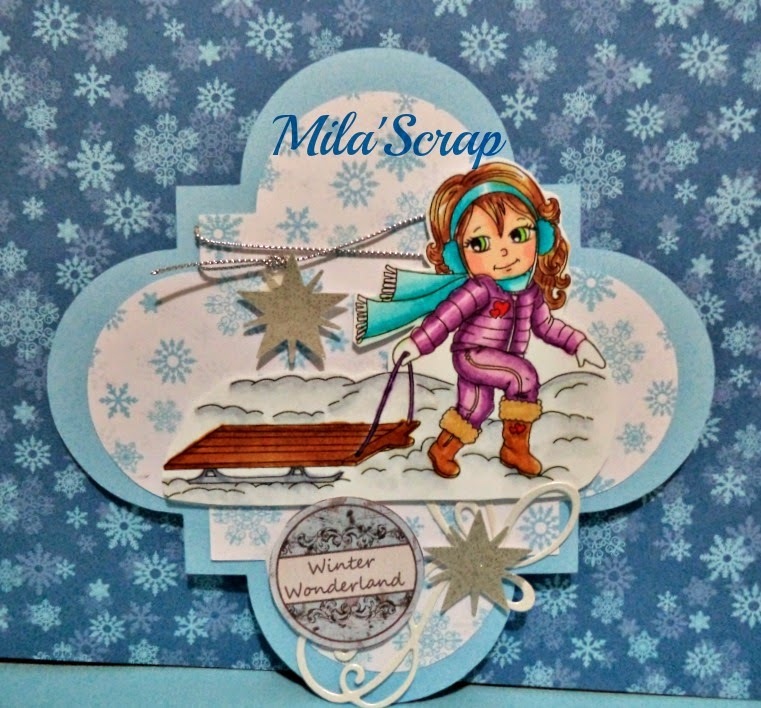 Here the card with Angelica's Sled you find here! Aqui com o close podemos ver mais de perto como Angelica é linda! E que o carimbo que tem um fundo de neve. Here with close we can see more closely how Angelica is gorgeous! 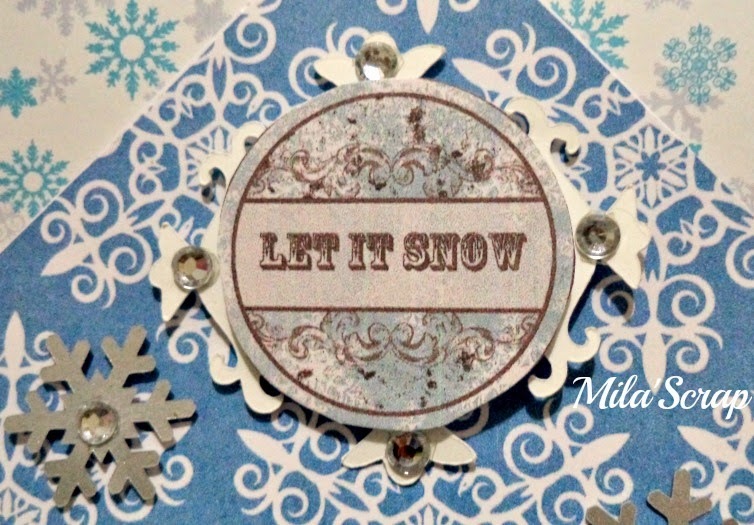 And that stamp has a snowy background. E por ultimo mas não menos importante um close para ver de perto os embellishments e o Sentimento. And last but not least a close to see firsthand the embellishments and the sentiment. Para pintar Angelica, o sled e o cenario usei Copics. 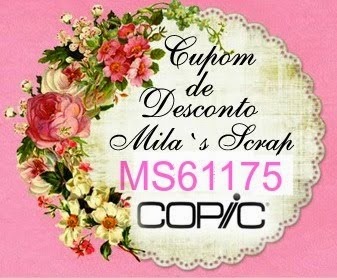 Os papéis para o cartão são da OKscrapbook e o Sentimento da MR Designs. 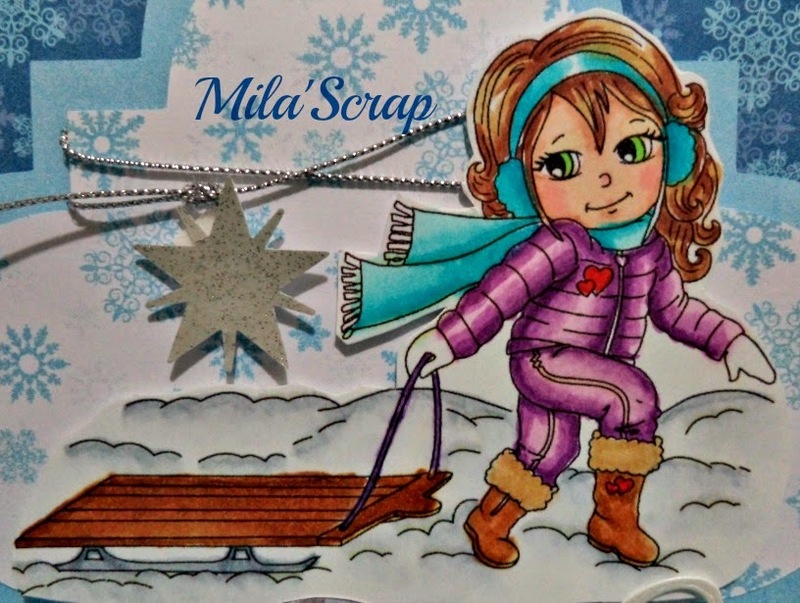 To coloring Angelica, the sled and the scenario I used Copics. 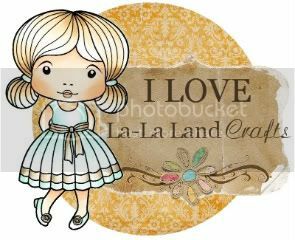 The papers for the card are OKscrapbook and the Sentiment of MR Designs. Espero que tenham gostado da novidade e ate o próximo Post! I hope you enjoyed the novelty and until the next post! Hoje oficialmente entramos no clima de Natal!!! Nosso desafio da semana é com o Boneco de Neve! Demais não é? Quem não gosta de um enfeitando sua casa, seu pe de arvore ou mesmo fazer um com as criancças na neve (nos países que nevam claro - apesar de que aqui em Canela ano passado nevou e meu filho fez um lindo Boneco de Neve e lógico outras brincadeiras divertidas! Today officially entered the Christmas mood !!! Our challenge this week is with the Snowman! Other is not? Who does not like a decorating your home, your foot of a tree or even make a criancças with snow (in countries that snow course - although here in Cinnamon snowed last year and my son made a beautiful Snowman and other logical funny jokes! O Cartão com um formato diferente que gostei muito! The Card with a different format that I liked a lot! 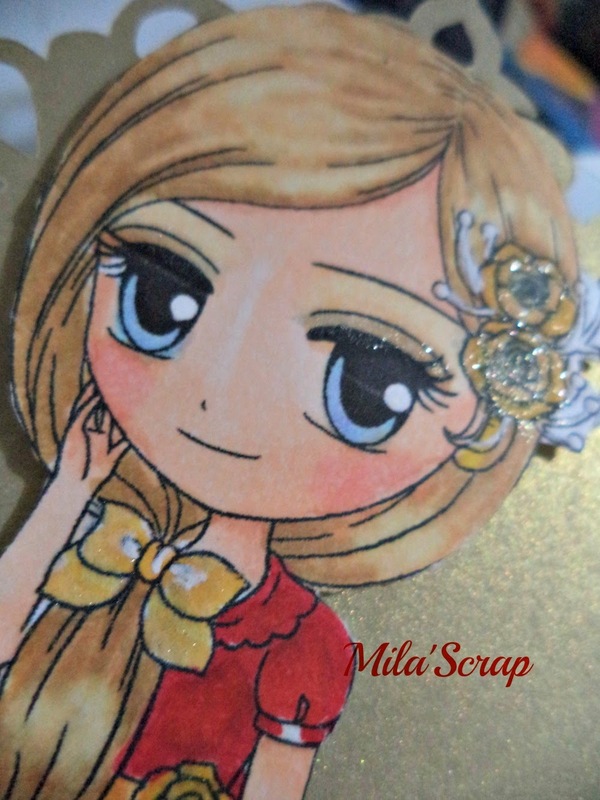 Eu adorei a combinações de cores que escolhi tanto para pintar como o papel e os embellishments não tradicionais para o Natal. I loved the color combinations that I chose to paint as much as paper and non-traditional embellishments for Christmas. Esse é o sentimento que escolhi para completar este lindo Cartão de Natal! Ah e claro os flocos de Neve para dar um toque especial! 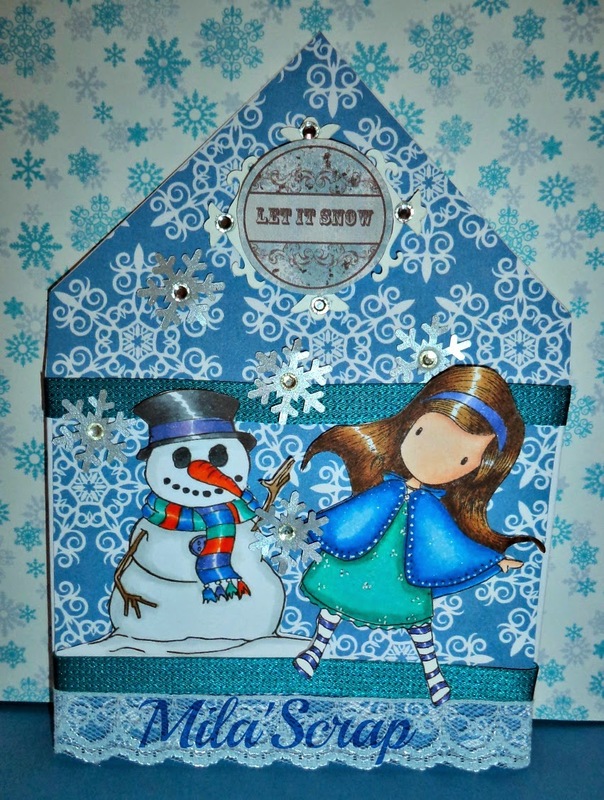 That's the sentiment that I chose to complete this beautiful Christmas card! Oh and of course the snow flakes to give a special touch! Os 2 carimbos foram pintados com Copic. 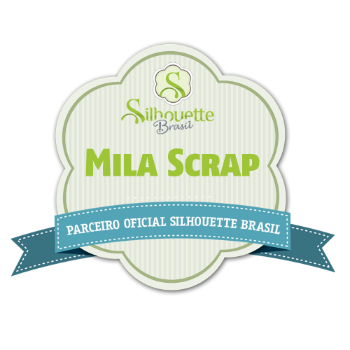 O Papel da OKscrapbook Maravilhoso! The two stamps were painted with Copic. 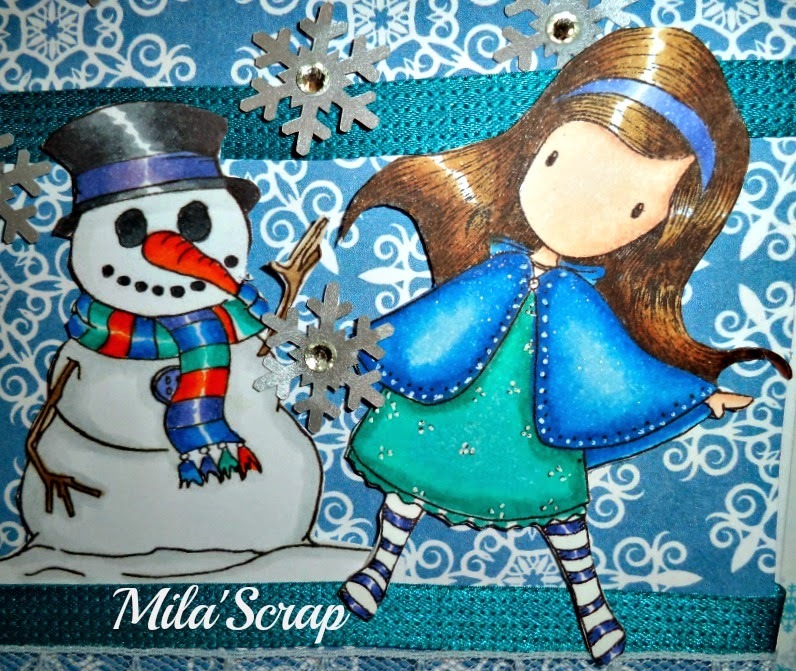 The Snowman is Free Winter Stamp Release Digi Amy Doodle and Gorjuss Little Red Stamp. 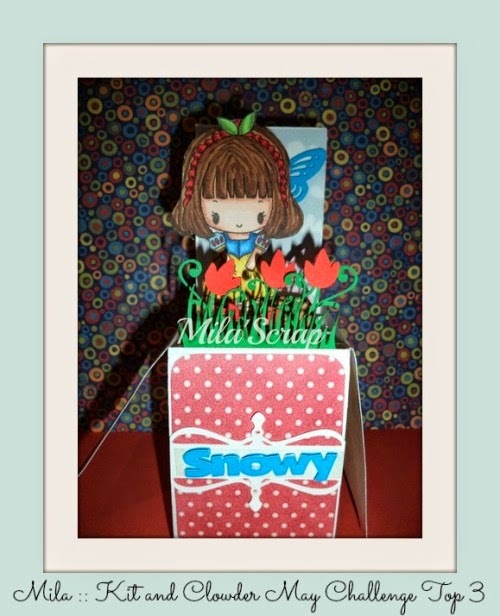 The Paper of OKscrapbook Wonderful! Espero que vocês tenham gostado e que partipem do Desafio la no blog! The Role of OKscrapbook Wonderful! I'm very very Proud Member!